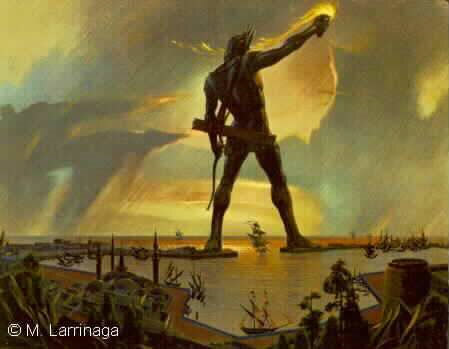 A monument to Greek power and in honour of Helios, it had become a metaphor for fallen gods and the decay of great civilizations. With the competitive and often warlike nature of mankind, it would seem there is a natural tendency to make things big at the expense of making them sensitive. Bluster is the greater part of power, and a strong sense of power is implied by size. This may be changing. Is it possible that a more understated and gentler world may be upon us? 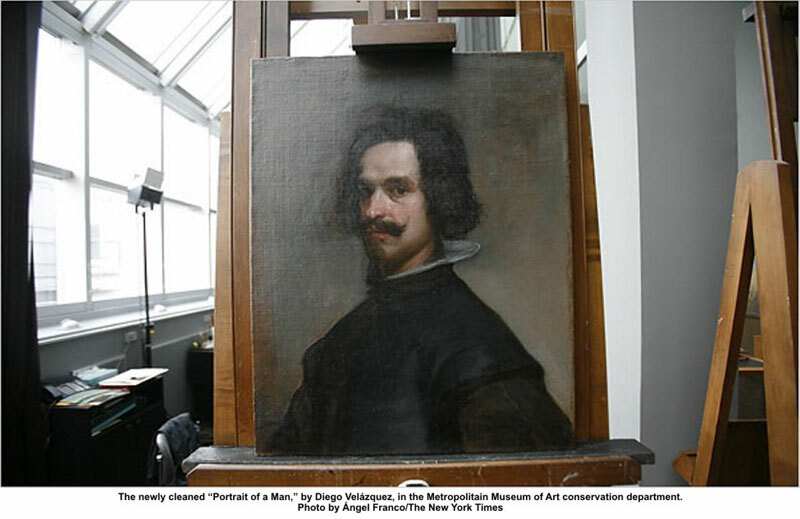 Recently, a few of us were looking closely at the newly reattributed Portrait of a Man, a smallish canvas now certainly thought to be from the hand of Diego Velasquez. Probably another self-portrait, it shows a remarkable feeling for character and a penetration of personality. “A small gem,” said somebody. “That’s quality,” said another. If we were any closer our noses would be rubbing on it. Not that size can’t have quality. 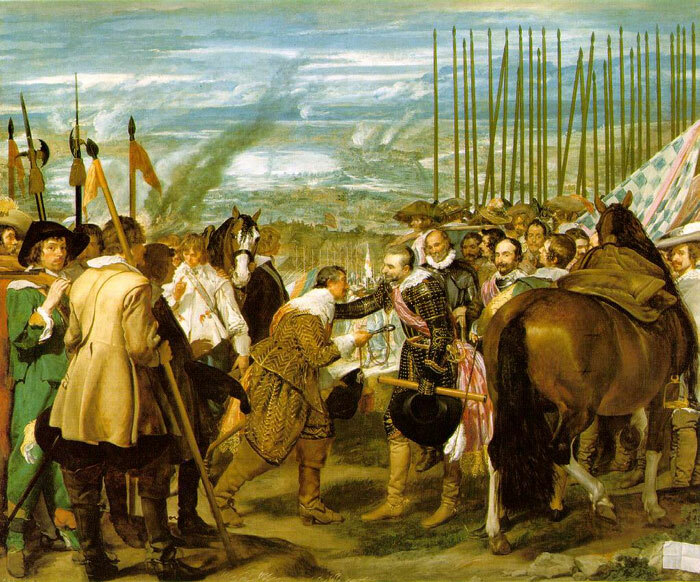 Look at the giant canvases of Velasquez. They’re often an assemblage of smaller gems. Integrated as a significant whole, sensitive to colour, light and nuance, an understated, decentralized self-portrait may be placed here and there with care. 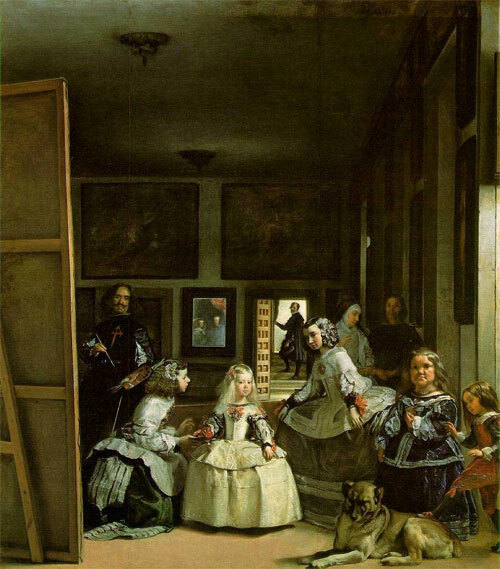 by Velasquez. That’s him again on the extreme right. Is it simply a matter of size? Having recently seen some Cy Twombly work (much of which was NOT giant wall-filling work) in a museum with works of other artists also, I might guess that Twombly was being given a quick pass for reasons other than size. Do a google image search for Diego Velasquez and for Cy Twombly and see which images hold your attention for longer. For many people, modern abstract stuff that (rightly or wrongly) falls into the stereotype of “it looks like my kid could have done it” is not going to hold the attention as long as a realistic intricate painting. Robert! I loved the video. A vintage Bentley, a beautiful companion and paint! Life could not get more perfect!! Was that scotch perhaps hidden away in that water jug? Loved it all. Modesty is in vogue in many western countries these days, but once the good times get rolling again I’m not sure how long that’ll last. The bigger-is-better mentality is living large in China. Do any search for Chinese art — especially in the ‘cultural’ capital of Beijing — and you’ll see towering works of art that are made in huge studios. Large studios and scale give ‘face’ to the artist, and eventually to the owner. These works are made by highly-trained artists whose technique puts many western art students to shame. One is physically impressed when faced with these works in a way impossible with those made on a smaller scale. There is a pragmatic awareness of the worldwide art market there that might be of value to western artists who would like to earn a living with their talents. A recent post I wrote from Chengdu, western China, in much more humble surroundings than what one sees in Beijing, but made in studios much larger than my current space in Sydney. I love your work! It almost looks like an etching, very nice. You bring up a valid point about the big studios. Artists who attempt to make large paintings need big studio space, not to mention storage areas. I’m doing smaller paintings lately, just to see the difference and because my studio was getting too crowded with largish canvases. What size is “Market”? Robert chooses an image from my flickr stream to post – and this is definitely a small one! It’s printed on Chinese joss paper which is burnt at funerals, and is quite small, about A5 size. 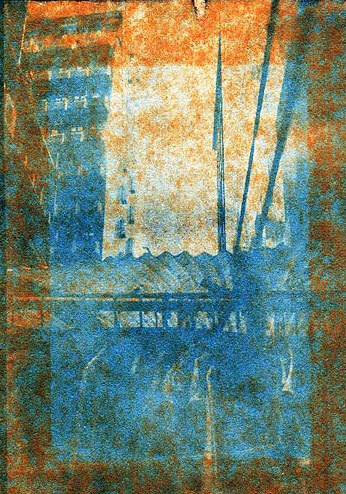 It’s a cyanotype blueprint, an antique style photo printed in the sun. I have been tussling with the issue of size for a while now. 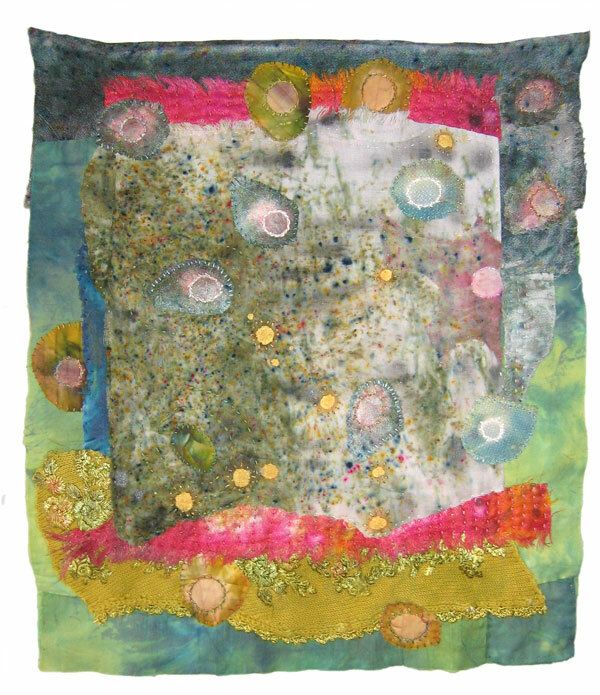 It’s especially problematic with my medium, stitched textiles. At little more than arms length, stitching, either machine or by hand, is mostly lost. I’ve come to recognize that no matter what size the piece, the design has to be created for our hunter’s eye — something to be seen from across the field, across the glade, across the room. There must be an organization of shapes and colors that will draw the viewer in for a close look. Only then can they be charmed or captivated by details such as brush work, or stitching. I`m a weaver, felter, quilter, painter. I love your small piece, the colours and shapes, and its intriguing details. More and more I am drawn to Big Painting but with tiny details, surprises, that are not noticeable at a distance but which interest the near-sighted viewer. The tendency to grandiose is the sinecure of the big aggressive nations who run on bluster and ego. These bully boys carry a gun and think strength is morality. Yes, there is a correlation between posturing and big art. Is it not time to look toward our feet at the small beauty we were given, and love and cherish before it is too late? As a collector of fine art (when I go to London) I look for delicacy and sensitivity in the small and gemlike. I may be out of step but also I may be in tune with the Age of Aquarius, the new gentler societies, and besides, they go into the smaller and smaller spaces which we of the overcrowded planet must endure. While small does not guarantee quality, it’s okay with me. This is exactly what I’ve been thinking, too. Sensitive and gemlike; wonderful qualities that I admire in art. When I started weaving in the 1970s and I attended my first Northwest Weavers conference I was amazed that the jury chose to recognize a very tiny piece as their choice of best in show. It was a gem and I can still remember it. Work in the size that appeals to you. Quality is not about size. I am truly dismayed at the small and narrow vision Robert has concerning painting size. I run quickly past the never-ending landscapes and still lives in their dainty 11 by 14 frames to study the larger explorations and visions of painters like Cy Twombly. There is a tremendous emotional difference between a 10 inch swath of red versus a ten ft. swab. I am 73 and have often been advised to paint smaller for practical reasons. When I do I feel like I am making a sweet craft, like knitting, but I always return to the challenge of saying my vision on a larger format. I am comfortable doing my figurative work and meeting the challenge of a 4 by six foot canvas. DAINTY, I AINTY and proud of it. Every artist has his/her own vision that resonates and seeks expression. Why must this even be stated? Bravo to you for seeing meaning in the large doleful eyes of a 4×6-foot bovine. Bravo to me for seeing meaning in a 9×12-inch vista of fields, trees, and mountains. How right you are! I’ve been looking for a word to describe a whole lot of small paintings I did in the early years, before I “transcended” to large canvases, and now I have it: “garbage”. Every time I look at them I think to myself: they have to go. About 80 have already left, and one of my New Year resolutions is to leave myself only with paintings I am prepared to own up to, and most of them are big. I suppose I could have recycled some of them, but they are simply too small to bother with. The saying I’ve heard is this: If you can’t make it good make it big and if you can’t make it big make it red. It may be the financial excesses of the ’80s-’90s that have ended have also taken with them to a certain degree the excesses in art of large scale artifice and only the surface appearances of intelligence. Where I was thinking traditional painting must surely have peaked by now, it may be that these times will foster an even greater appreciation for quality realist painting over large absurd vats of Vaseline and rooms filled with piles of salt with broken mirror. At the very least, it’s more understandable. I do photomontage/collage and enjoy working small, but not as small as an ATC (not yet!) which are enormously popular. I prefer small, the challenge of it and also a sense of privacy about it. The question is… Is 4″ x 6″ a composition that seems simple enough at a glance, but is complex depending on how deeply you’re willing to look at it? A favorite quote of mine by Thoreau, “It is not what you look at, but what you see,” seems to apply to all the hours of my days and to my work. I’m with you on this, and what comes to mind are two wonderful special effects shots in fairly recent films. They present the proof of the assertion that smaller can be better. In the first, Jurassic Park, there’s that lovely sequence where Dr. Grant and company see the dinosaurs for the first time. Two of the shots are of a lake, with brachiosaurs wading across. But at the edge of the lake is a herd of hadrosaurs (parasaurolophi, for the purist), tiny in the shot. They seemed utterly alive to me, and when one moved his head as a horse would, my eyes bugged out. I was in that moment, in a way I don’t often experience in a theatre. The second example is from the 2002 remake of The Time Machine. Aside from the score by Klaus Badelt and effects, this was a wide miss. One shot, however, showed the time machine traveling forward, within the laboratory. ‘Way in the background were shelves of plants, growing, dying, growing, dying. They were also very small in the shot, and the emotional impact was startling. As I thought about it, I realized that the scale of these very watchable bits of the picture were so small that they required my active focus, and hence, participation. Being little and distant, they drew me right into the shot, where I had no choice but to be “present” and affected. If ever less were more, it was here. Perhaps it is a good idea, from time to time, to go back to the tiny details of things, the delicious ornamentation that we sometimes miss, immersed in the “big picture.” Great and small, each offers its own delights. 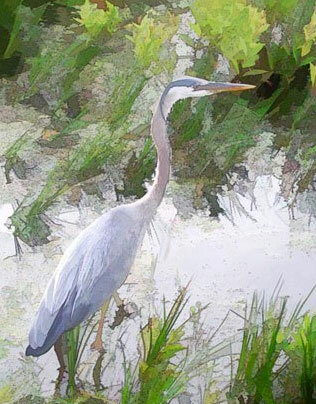 Really like your Heron picture.Every time I see one in the wild,I feel good luck for the day. I love this analogy. Even in my abstracts I adore those sweet little moments the most like the swirl of a black splatter in just the right place. Large paintings are sometimes necessary to convey a visual message with proper impact. Size can impart a sense of priority. A lartge painting flanked by smaller ones will be the one that first draws one’s attention. By the same token, the larger painting should contain elements that might be unnecessary in smaller works. So size should not necessarily depreciate a work, just as neither should it be necessarily a determinant of quality. Tonight I sat in front of my TV watching a documentary about the state of the world we currently live in. Hosted by Leonardo Di Caprio and with dozens and dozens of scientists and experts all claiming the world is in grave danger. There is a danger of global warming with the Arctic and Antarctic disappearing. How rain forests have been depleted to deserts and now cause major flooding because the trees no longer absorb thousands of gallons of water. They said that the fuel company EXXON makes more money than the entire motor vehicle industry. The light bulb moment for me was when Dr David Suzuki spoke about how since the dawn of life on this plant 99.9999% of the living things have become extinct. We as human beings and as important as we think we are, are part of nature. At the excellerating speed that we are depleting the earth within 50 years, human being will be living in state we cannot begin to imagine. I watched this show with my fist in my mouth. So, reading tonights comment about an ancient sculpture being taken away by 900 camels doesn’t really seem to matter to me. I want to recycle my plastic paint tubes, trade my car in for an electric vehicle and work at making the world a better place. Sometimes size is the most important compositional element of a painting – like the Dali in the lobby of the Beaverbrook, so appropriately named Santiago el Grande, so big it takes up permanent space in your brain. It is spectacular. That large canvas allows the open spaces into which you can transport yourself. A small, intimate painting can be very sweet indeed, but I have not been transported by a small canvas the way that gigantic work carried me away. It makes you fly. I have to say that if you are Seurat and want to paint a picture of a day at the park, I hope you choose a huge canvas. I have never been so surprised as I was to run into the Grande Jatte painting in Chicago. However, if you are just a ordinary working stiff making paintings, you had better get a huge house to hang them in. It will take a lot of marketing to get the corporations to hang your work in their lobbies. People usually don’t choose paintings the size of Lake Michigan for their livingrooms unless the artist is famous and they are rich. 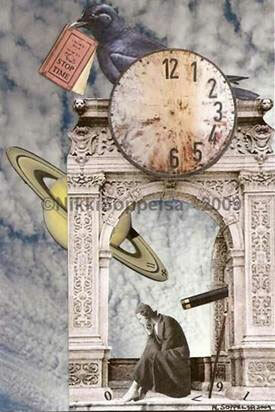 This reminds me of an exhibition of surrealist paintings I visited in Duesseldorf (Germany) a few years ago. I’m often surprised that famous paintings I admire are in fact smaller than the image of them I have in my head, so when I found myself standing in front of Salvador Dali’s melting clock (The Persistence of Memory, 1931, MoMA NY) and realized that it was really very small, in fact only 9 1/2 x 13″, I had to think again about relation between the size and value of paintings. Many of Dali’s works are of course very big, but at that exhibition there were some quite tiny ones on show and they were just as brilliantly executed, and they all took my breath away. Dali’s attention to detail is unparalleled! Size is just another element in art. If you want something to shout, “Look at me!” of course you paint it big. If you want an intimate painting to look at every day, smaller is better. If you want to draw attention to your display, put up a large painting. If you want to sell to regular people, put your medium and small paintings next to it. Size is a qualitative element, too — you have to compose pictures differently if they are different sizes. A paperback book cover should probably have a different design from a poster or billboard of the same item. And, face it, large paintings are usually more impressive than small ones. Several years ago I went to Tulsa, Oklahoma to see a special exhibit of Thomas Moran’s small watercolors and larger works in oil. As a watercolorist the small watercolors were gems. Those small paintings inspired me to do better in my own work. However, seeing the majesty of his huge oil painting “The Grand Canyon of the Yellowstone” just blew me away. I don’t think we would have Yellowstone as a national park today if Congress had to rely on the small watercolors even if they are gems. My greatest desire is mastery and understanding of all elements regardless of the subject in the medium of oils – color, strokes, and so forth – big and small. So when I work early in the morning I work on large and very small paintings. Some artists paint large canvases specifically for museums, huge naturally lit rooms that allow for viewing a piece twenty paces away. Some paint for homes, smaller canvases that one can admire from a few feet away. In between are public places, corporate lobbies, hospitals, boardrooms, etc., what I would term a comfortable size that can be displayed effectively just about anywhere. Given the choice go larger. Please. It is better to have a large piece of glass in your window than a small diamond on your finger. Different realities demand different solutions. Big or small art must contain a certain magic. Dear Robert, It is a hope devoutly to be wished that small would be considered better than “might-makes-right.” Alas, I fear it will be awhile before this beautiful concept makes it to fruition. In the meantime, we can only work toward that day. Cy Twombly. Not too good an example of monumentalizing bravado and derring do. Rather the patron saint of wimp made large. For some reason I need and tend to work in a large format. But I find the intimacy of small works draws one into that depicted world. Your emotion resonates with me loud and clear. The world is on the brink of a huge change. I too, and many others want to do something about it. I don’t think that recycling tubes or going electric will do much. Think of the magnitude. I don’t have children (for reasons that don’t matter here) – but think of the magnitude of impact on the earth of having or not having a child. I don’t know if more and more of us childless people are a part of the solution, or just a coincidence. But it can’t be ignored that multiplying oneself into the future with prospects of exploding one person into a huge population in a few centuries – with all the human by-product of needs, supplies, needed and needless spending, mindful and mindless destroying that goes with being a human, has an impressive impact. Without having children, there is no future for humankind either, but it appears that some kind of a balance is already starting to happen. I think that it’s way beyond our comprehension how it will pan out. I will carry on with my recycling and reducing the effects I have on the environment, thank you for bringing that up. Jackie Knott, are you buying? Americans like everything BIG? Maybe this is good and maybe this is bad. The overriding issue for me is not size per say so much as quality. To have two tons of wheat dumps onto my doorstep would cause me great distress. On the other hand if I receive a loaf of bread; it would be welcome in my house. I think the issue of big is better is changing partly because money is scare and the future is uncertain. But make no mistake, BIG will make a comeback when the economy improves. Just look at what we havent learned with the auto industry. Its human nature to want more; The Biggest, the Best, the Most. It stems from not having. It’s the reason humans became hunter gathers from nomads. We create stores of goods for when times are lean. Most of us come from immigrants who had very little, and when the opportunity to have more arose, we ran with it and instilled this notion in us of accumulated wealth. There can never be too much. More is better. Hence bigger is better. It demonstrates to others our wealth and good fortune. A big car, big house or lots of land and possessions. Only after these needs are quenched do we consider- something small. This only to assuage the notion that yes we can show restraint. We can appreciate little things. This also shows us to others as being more Godly, in tune with nature and not altogether complete gluttons. But make no mistake, when the opportunity arises we will always equate bigger with better. There will always be big art and small art as well as reasons for purchasing each. But the real bottom line here is to love whatever you purchase for what it means to you, for its quality and value, not its size. Thank you for your timely letter. My husband and I just got back from NYC. Yesterday, we visited the MoMA. We were appalled at some of the displays that were considered art. One blatant, large display was of several walls that had a single yogurt container lid in the center of each (complete with price tag and expiration dates). Not paintings; actual yogurt lids. Other, less obvious jokes of art were very large paintings that, in our opinion, seemed to be very poorly painted, yet these were supposedly the works of masters. I kept telling my husband that I had better paint a lot bigger, if I ever want to be famous. Hopefully, you are correct and people will go back to appreciating the quality of the painting, and not be so overwhelmed and “fooled” by size. Monumental is just another characteristic of applied technique. I’ve wondered though. Some of the Abstract Expressionists produced creditable smaller works. (My first thought was Motherwell’s collages.) However, sometimes expanse is part of the necessary language. Despite thinking so, I tend to believe that a lot of contemporary art is made big because that’s been the trend, and those are the things that have been purchased at astronomical prices. It’s as if some of the artists are adopting the large size as a halo effect. That is to say, they are thinking that if it’s big it will be (at least) regarded seriously. They might be right about that. We’re not all immune from such notions. Nonetheless, it would be wrong to disregard grand sizes out of hand, as an affectation. I find small, precious work annoying. I prefer my paintings to be a mite more robust. I keep telling myself the only reason I don’t have one of the Elegy for the Spanish Republic canvases is that I don’t have the wall space. Now how do I justify not having a Homer watercolor? Big ones, little ones, they’re all paintings, except when they aren’t. Is installation just monumental assemblage? Ever before wondered if Damien Hirst could have found a smaller shark? Issues of the emperor’s clothing aside, there is, after all, some “content” to the scale of the work. (Don’t back me into a corner and demand a justification for mentioning Hirst. I’ll just cower and defer to the pundits. It could be worse: I might have brought up Tracey Emin, though with her there isn’t so much an issue of size as of extent.) I appreciate small gems, but if you can fill a wall in an interesting way, I’m all eyes. I remember seeing a huge picture– I think it was an Alex Katz– that was almost all black but for a geometrical bit of deep blue in a corner. Suddenly I realized that I was looking at the side of a building at night. It was almost all negative space, considered from different perceptual perspectives. (In a way it was like Holme’s curious matter of the dog in the night.) That picture could not have been done at 16″x20″. As some have pointed out, scale or size is utterly immaterial to the issue of quality. A piece of real art with the soul it takes to engage people across time and culture can be as large or small as it needs to be. Is Michaelangelo’s Sistine Chapel fresco better than Da Vinci’s “La Giaconda”? Now, I am a hobby painter a dabbler just beginning, so whatever dimension the canvas, it will not be “art”, just a student’s study, so I paint on whatever I can afford. Nobody will buy it … I lie, someone did want one for a grand daughter so my years art income was $40. However, size becomes important when your work is presented as a saleable commodity. Then you must know your audience. e.g. Central ‘decor pieces’ for McMansions must fill large walls so, size, content, dramatic contrast and trendy colour fits are important. If you’re in this market better keep constant tabs on paint store brochures to anticipate what background hues your paintings must co-ordinate with next year. Several steps up, your corporate buyers are looking to fit out boardroom and public areas. Sizes will be large but so will buyer’s egos, everyone’s credentials, reputations, skills and even your artistry. On the other hand, ordinary folk bypass the wall size stuff and gravitate to smaller, more intimate and more affordable works and content they identify with. Making paintings and sculpture are arts but selling arts is a business so find your market and learn it well. Or do a ‘Vincent’ … put in your 10,000+ hours, letting your family sell if they can … maybe you can get discovered on the basis of sheer quality. If so it will be because it is art, not commodity and the dimensions of the works will be utterly immaterial. Esther, buying what? I see no means to contact you. Am I buying paintings? Buying into a premise a member has posted? The only difference between a small painting and a large one is the distance one must stand while viewing it. Two disparate European masters illustrate the smaller side of things, Vermeer and Paul Klee. Most of my paintings are 9″ x12″ or less. I like getting the ideas out there quickly. The small sizes don’t take much time; they are affordable, and eligible places for hanging in the home are more numerous. 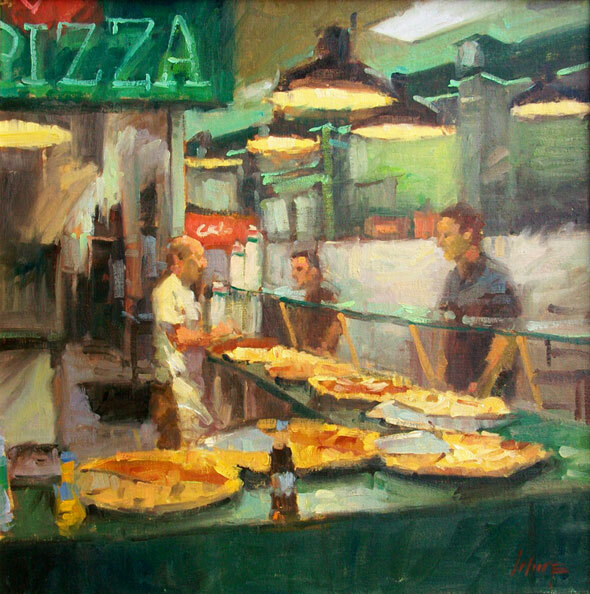 painting on a large scale has a completely different set of rules than painting small. I have to disagree with Audrey Flacks opinion. There are some emotions and ideas that have to be expressed very small and others very large. Composition for a small area is much different than a larger area. The larger the area to be painted the harder it is to have a good composition. Conversely small works are not easy either as the space being so limited detail becomes important. Some artists are suited to painting murals or large works while others a more suited to smaller scale works and miniatures. It’s like comparing apples to oranges. Both are fruit but not the same. As much as size is an issue in painting, it is much more so in photography, my chosen medium. With modern digital printing the size of a photographic based image is almost unlimited. Unfortunately there are few subjects that are really better, in my opinion, that big. The “artist” tends to composite many elements to create their scene and make it as realistic looking as possible. I’ve seen a few, of scenes large in scale, when printed fairly large that work, but too many are going big because they now can. OK, maybe I’m just a traditionalist. I use Black and White film, process in my own darkroom and make chemical prints. I have given into using a film scanner for proofing and to be able to post images on-line sooner then I could print and scan. I use 8″X10″ paper and make images that are the crop I used in the camera, at least for the most part, and are about 6.33″X9.5″. I mount them on 11″X14″ board with a window overmatte. I have shown a few times and enjoy watching people get close to the work and really look. With my process there is a lot of information in my prints which people see up close. I’m not convinced that a large print would be as enjoyed. Please keep up the great work with your letters. I enjoy every one. Some pictures need to be big; some say it all in a small way. Certainly, when displayed in a gallery, big attracts attention first. I’m often surprised that the painting that looked large and impressive on my studio easel may look small and undistinguished on the walls of a gallery. I think that in today’s world of “art stars”, sometimes the artist has become more important than the artwork. Finally, on the theme of size, quality – and projection – your readers might be interested in checking out the work of two European artists: Gottfried Helnwein and Franz Gertsch, who paint monumental, but sensitive portraits. In contrast, there’s the work of Karel Funk and Robert Bauer’s tiny perfect paintings. Similar subject matter and masterful paint handling, but completely contrasting effects. You ask whether the art world is moving from big and blustery to sensitive and understated. I think that, as always in the past, some artists will paint bluster, some will paint sensitive. Some will choose bluster on stormy days and sensitive to capture the calm. My medium is sumi-e or Japanese Brushstroke. In this method you simplify your work down to the least number of brushstrokes to capture the essence of what you are painting. I paint wildlife and domestic cats and horses primarily. I have found that clients visiting my studio will usually love the work but cannot narrow it down easily to just one piece they would like. They seem to puzzle over it often saying they have never seen work where they would willingly take any or all of them home despite the usual complaint of lack of wall-space. I have yet to figure out a way to help them with this particular dilemma. 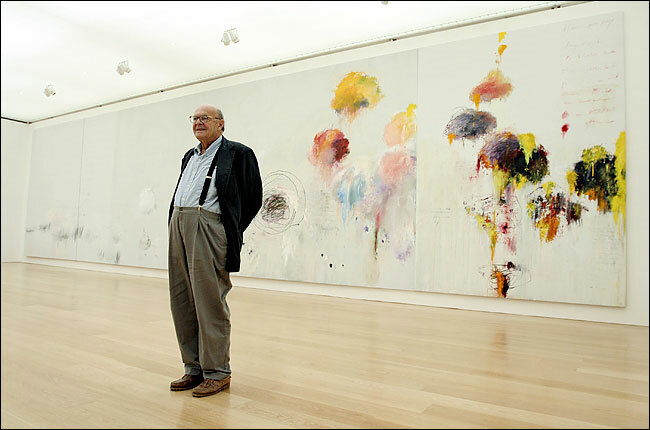 I would pass by every Cy Twombly, massive or tiny, and would spend hours before any Velasquez, big or small, and have. Size doesn’t matter….if it is finely crafted, beautiful, and contemplative and gives joy from a distance as well as up close, it is art I love. (It helps to be a Velasquez, however). 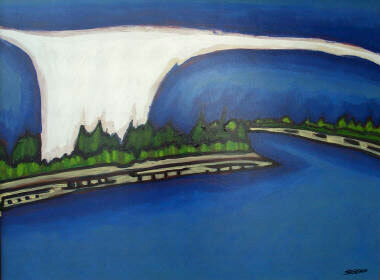 Try not showing your clients many similar paintings – show them just a few which are the most different from each other. That may help them pick what speaks to them the most. Imagine being offered a smorgasboard of cakes – or if you have to select from a 3 (if you can eat only one). I think that Robert’s point was more geared toward evaluating weather the current trends of the high-end art market correspond to the current values of the society. But, such discussions usually trigger “what do I like” – personal responses…which are fun to read, but don’t really have much value in the big picture. I think that what the top dogs are doing and selling must have some relationship with the values of the society. If small gems are promoted and get sold at astronomical prices, small dogs start dreaming of small gems as well. But those things change all the time and the ultimate lasting value survives all the trends – or at least the history that we know of shows that. We can all list big and small timeless art respected across generations. gail caduff-nash, I disagree with you – that was exactly my point. If you try to make million things do dumb useless things, the chance they will buy into the preservation of the planet will go down the drain. If you are honest in what humans need to do in order to preserve the humans – then we are getting somewhere. All this mumble jumble about art, this is not rocket science! You would think Robert you are the only one that can paint. Stop being silly it was like reading the NY Times, a lot of print that says nothing. Art and painting is for whom ever wants to give it a try. Loved the shoulder clip of the forest. To watch you at work and wonder at the deft strokes, the negative space shapes, even the coloured wash that you wipe over all. Copy you? I couldn’t, but your work energy is inspiring, to give me at least the nudge to trust my own strokes,patterns and improve on the areas I fail in (composition!) 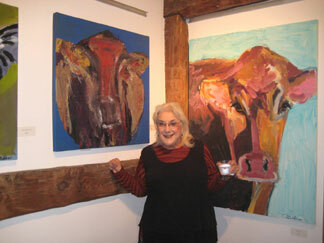 Now I will go back to bed and sleep and dream of finishing my painting of a garden a gate and a cow! Before trading for the new electric car, please ask yourself how the electricity is generated. In the U.S. most electricity is generated by coal burning power plants. Brenda, that comment was rude. This is Robert’s web site. Do you also go to someone’s house and say – what’s the big deal, everyone has a house? I just love your ease with the brush and truly seeing with your eye’s. I think you are correct in thinking that, in most cases, larger is worst. Do the larger artists think that because it is big it will be put in a museum? Seems to be the case many times, whilst the smaller gems don’t get noticed. I just received your latest book and even my husband was impressed. Not only by the size of the book but the contents. It will keep me busy for years. What a beautiful masterpiece. Your checklist for a “full” painting is pretty good, but I think you left out one element that is very important, ie,metaphor. The pieces of art that seem to stick in my mind, always “say” something. That something can be as simple as a mood or a feeling, but it must be there to capture my attention. One can always appreciate consummate skill, but the real magic of a powerful painting is the story it tells without words. In essence what you are saying is “it needs your full attention”!? because I needed to give the work my full attention. I realize that many things about the painting process have become automatic after painting so long, but much still needs to have my complete thought process focused on the work. Even when I teach, I keep the talk (instruction) to a minimum and speak quietly when I do speak. I know I can walk and chew gum at the same time. Doing several things simultaneously is good except I prefer to paint in private with only sounds of music breaking the silence. Thank you for the painting demo in the forrest…it was wonderful… I think I was holding my breath while I watched you paint. I think that is what I do when I am painting — I will change that from now on. Thank you for your letters. Your checklist is one of the most accurate and complete definitions of a piece of art. Thank you again for sharing your most valuable knowledge of a painter at work. I find that people who buy art, buy lots of art and therefore run out of space for large pieces. People who don’t often buy art won’t pay what a large piece is worth. So if you are marketing your art the medium sizes are more likely to sell. But then many of us paint for our own pleasure. It is good to be able to sell enough to pay for more supplies.